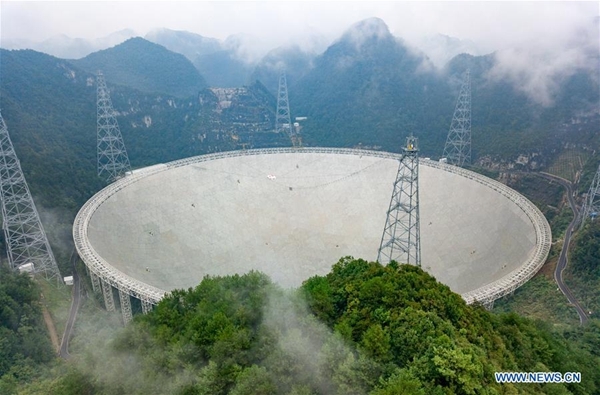 The telescope, located in a naturally deep and round karst depression in southwest China's Guizhou province, was completed in September 2016, and is now under commissioning, with normal operation to commence later in 2019, according to the National Astronomical Observatories of China (NAOC). During testing and early science operation, FAST started making astronomical discoveries, particularly of pulsars of various kinds, including millisecond pulsars, binaries and gamma-ray pulsars, said Li Di, chief scientist of the Radio Astronomy Division of NAOC. FAST is the world's most sensitive radio telescope. Scientists have proposed ambitious observational objectives through FAST, such as gravitational waves, exoplanets, ultra-high energy cosmic rays and interstellar matter, to advance human knowledge of astronomy, astrophysics and fundamental physics. An international team of scientists' plans on how to best apply the unprecedented power of the FAST radio telescope were recently published in a mini-volume of Research in Astronomy and Astrophysics, an NAOC journal. "Planning new observations to find new targets and new kinds of objects beyond the reach of existing facilities is one of the most exciting jobs of a professional astronomer," Li said. The first major sky survey of the telescope, the Commensal Radio Astronomy FAST Survey (CRAFTS), is being planned. The key innovation of CRAFTS is its capability to simultaneously record pulsar, hydrogen and fast radio burst data streams, Li said. Deeper surveys are also being planned, in particular, those of the Galactic plane and the M31, our largest neighboring galaxy, Li said. "Discoveries such as new pulsars and unknown structure in the interstellar gas of the Milky Way have already been made, with more coming day by day. The capabilities of FAST are living up to our expectations," Li said. Scientists believe more discoveries will be made by FAST telescope, going beyond expectations. "When such a powerful new telescope begins its scientific observations, unexpected signals and effects often emerge," Li said. The international team has made plans for difficult and demanding observations, going beyond what has been done by other telescopes in the past. These observations may lead to unexpected discoveries, because of their ambitious and challenging performance requirements, Li said. "As these observation projects will be launched over the next few years, FAST will have an impact on many areas of astronomy and astrophysics around the world. Although we cannot predict what it will discover, the telescope may profoundly change our understanding of the universe," Li added.